A light and newly decorated two double bedroom balcony flat on the first floor of this small and well managed block. It features nice open plan reception space with wood floors and good built-in wardrobes in both bedrooms, as well as a modern kitchen and bathroom. Quietly towards the northern end of Davis Road running parallel with St Elmo Road, the flat is conveniently close to the thriving Askew Road, a few minutes walk from Wendell Park. The shopping and transport hubs of Hammersmith and Westfield are within easy reach; the 607 bus route east along Uxbridge Road provides the fastest access to the Central Line tube. Stamford Brook or Turnham Green Terrace tubes are an approximate 15 minute walk to the south. 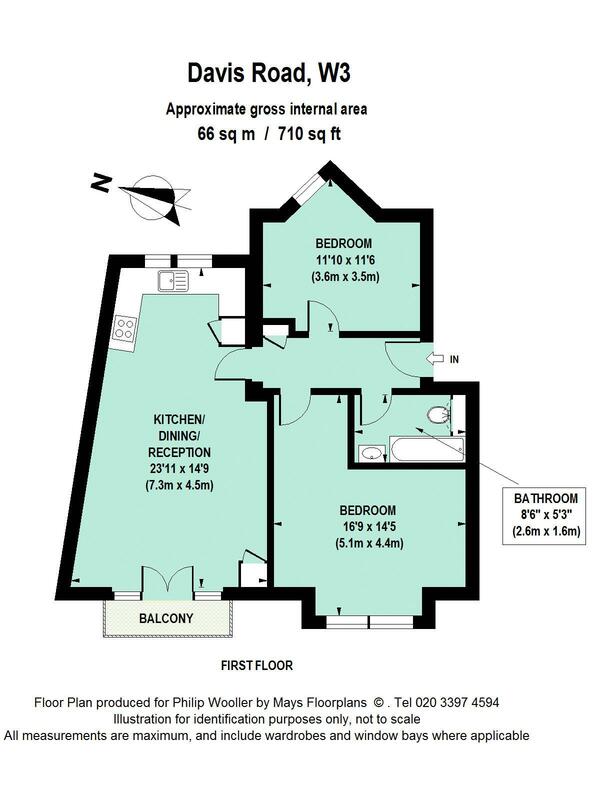 710 sq ft / 66 sq m approx.